No matter how hard you try to keep your sofa clean and looking like new, it will eventually get dull and dirty over time. Your sofa is probably the most extensively used piece of furniture in your home, and as a result, it attracts all kinds of dirt and stains. Of curse, the longer the stains sit, the harder they are to remove. But you can't toss your couch into the washing machine, so how do you remove the stains? Try calling the professional area carpet cleaners to deep clean your Kennydale Washington sofa and other upholstered furniture. We have specialized in sofa and loveseat cleaning throughout the area for over 30 years. Simply call (425) 559-9995 for a free estimate for service. Even the toughest of stains can be removed from upholstery by professional sofa cleaning services. Continental Carpet Care, Inc. has been serving residents for the last 30 years, specializing in both wet and dry upholstery cleaning in Kennydale, depending upon the fabric. In addition to regular cleaning, we also offer detailed cleaning services to remove tough stains and dirt. Whether your children have spilled their drink on your sofa or your pet has left a little gift on your favorite recliner, Continental Carpet Care, Inc. has the capabilities to get rid of the nastiest stains without damaging the fabric. Then, a safe sofa cleaning solution is applied to pre-treat tough stains. Next, hot water extraction is done to make the solution reach deep within the fibers and remove the stains from within. 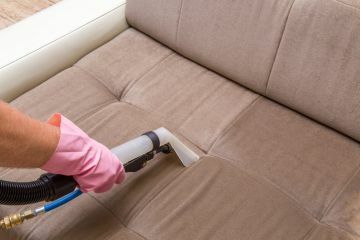 Once all dirt and stains are gone, the upholstery is rinsed using high powered extraction machines, so they dry quickly. The result is a beautifully cleaned couch that is ready for use again in just a few hours. Why is Professional Sofa Cleaning Necessary? You might think that vacuuming your furniture and spot cleaning spills with generic cleaning agents will suffice, and it will for days and weeks. While regular vacuuming is good for cleaning surface dirt, a deep cleaning your sofa in Kennydale is recommended once every six months to remove tough stains and allergens that become embedded in the fabric. Call Continental Carpet Care, Inc. when it's time to clean your Kennydale couch, loveseat and other upholstered furniture.